MERALCO’s a three-day technology and innovation summit dubbed as MTECH 2016 opened last August 23, 2016 at the MERALCO Lopez Building Lobby. With the theme “Creating The Customer-Centric Utility“, it showcases new and intelligent ways to enhance customer experience through informed energy management and multi-channel services while boosting business agility and developing new opportunities for the distribution utility. The MTECH 2016 stages an Exhibit Zone and an Experience Zone that showcases Meralco’s partner brands latest products and services. 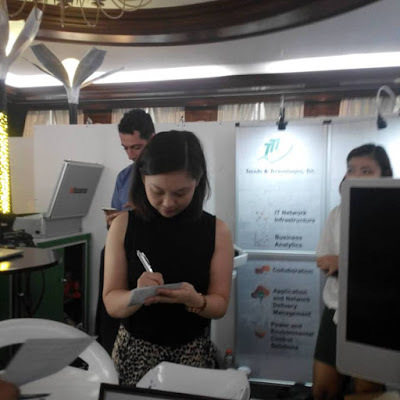 The Exhibit Zone in the MERALCO Lopez Building Lobby, will showcase the company’s leading technology partner brands such as, Dell, Hitachi, SAP, Pazifik Power, Lenovo, Symantec + Blue Coat, CALIBR8, Schneider Electric, Indra, Siemens, Huawei, Hewlett Packard Enterprise, Salesforce, Microsoft, Trends and Technologies Inc., Trend Micro, Geodata Systems Technologies, WSI, Smart, PLDT and Radius Telecoms will showcase their latest innovations. MERALCO Kuryente Load – the power utility’s prepaid electricity service will also be demonstrated until August 25, 2016. The Experience Zone, situated inside the MERALCO Theatre Lounge features Smart Home Solutions by Schneider Electric (which includes appliance control and electric consumption monitoring), Indra (smart sensors and appliance control through smart plugs) and CALIBR8 (electric consumption monitoring and analytics). The Experience Zone carry exhibits by Lenovo (tablets, PCs, and Laptops), Dell (tablets, office PCs, gaming PCs and laptops; servers for back end systems), WSI Philippines (large format displays and office printer), Trends and Technologies (sound system), Microsoft (Xbox One and VR device) and Abenson (home appliances).